Simon has been practising and teaching yoga for over 30 years. 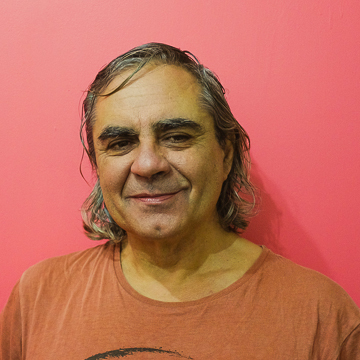 He is the founder / director of St. Kilda Iyengar Yoga School, Melbourne since 1989 and has been teacher-training many yoga teachers in Australia since 1992. He went on to create the Yoga Gurukul retreat centre in 2005 in the idyllic and beautiful rainforest region of northern NSW. He has been travelling yearly to Pune, India to study many times with our late Guruji BKS Iyengar and also has attend many workshops and classes with Geetaji Iyengar and Prashantaji Iyengar. He teaches all over Australia and internationally, he is a Senior Iyengar Yoga teacher level 3. In 2016 Simon was awarded a Master Yoga Teacher Platinum certificate by the Yoga Alliance Australia, one of only 6 people in the world have this distinction, celebrating genuine Yoga Masters of our time. In addition to a deep understanding and practice of yoga asana (postures), pranayama, meditation and mantra, Simon has combined his love for chanting with his love for a stratocaster.